Do you wish you had a better understanding of the internal workings of traditional karate techniques? This series teaches you the principles of body dynamics and how to create the most powerful arm and hand techniques possible. 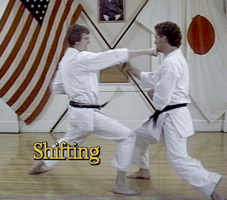 “Principles of Body Dynamics” provides a detailed breakdown of the body dynamics used in Shotokan Karate. Sample techniques are used to explain the dynamics of shifting, rotation, vibration, lifting and dropping power. These principles are used to create momentum and generate the tremendous force developed by traditional karate.